Fructolysis refers to the metabolism of fructose from dietary sources. Though the metabolism of glucose through glycolysis uses many of the same enzymes and intermediate structures as those in fructolysis, the two sugars have very different metabolic fates in human metabolism. Unlike glucose, which is metabolized widely in the body, fructose is metabolized almost completely in the liver in humans, where it is directed toward replenishment of liver glycogen and triglyceride synthesis. Under one percent of ingested fructose is directly converted to plasma triglyceride. 29% - 54% of fructose is converted in liver to glucose, and about quarter of fructose is converted to lactate. 15% - 18% is converted to glycogen. Glucose and lactate are then used normally as energy to fuel cells all over the body. Fructose is a dietary monosaccharide present naturally in fruits and vegetables, either as free fructose or as part of the disaccharide sucrose, and as free monosaccharides in honey. It is also present in the form of refined sugars including granulated sugars (white crystalline table sugar, brown sugar, confectioner's sugar, and turbinado sugar), refined crystalline fructose and as high fructose corn syrups. About 10% of the calories contained in the Western diet are supplied by fructose (approximately 55 g/day). Unlike glucose, fructose is not an insulin secretagogue, and can in fact lower circulating insulin. In addition to liver, fructose is metabolized in intestine, testis, kidney, skeletal muscle, fat tissue and brain, but it is not transported into cells via insulin-sensitive pathways (insulin regulated transporters GLUT1 and GLUT4). Instead fructose is taken in by GLUT5. Although the metabolism of fructose and glucose share many of the same intermediate structures, they have very different metabolic fates in human metabolism. Fructose is metabolized almost completely in the liver in humans, and is directed toward replenishment of liver glycogen and triglyceride synthesis, while much of dietary glucose passes through the liver and goes to skeletal muscle, where it is metabolized to CO2, H2O and ATP, and to fat cells where it is metabolized primarily to glycerol phosphate for triglyceride synthesis as well as energy production. The products of fructose metabolism are liver glycogen and de novo lipogenesis of fatty acids and eventual synthesis of endogenous triglyceride can be divided into two main phases: The first phase is the synthesis of the trioses, dihydroxyacetone(DHAP) and glyceraldehyde; the second phase is the subsequent metabolism of these trioses either in the gluconeogenic pathway for glycogen replenishment and/or the complete metabolism in the fructolytic pathway to pyruvate, which enters the Krebs cycle, is converted to citrate and subsequently directed toward de novo synthesis of the free fatty acid palmitate. The first step in the metabolism of fructose is the phosphorylation of fructose to fructose 1-phosphate by fructokinase (Km = 0.5 mM, ≈ 9 mg/100 ml), thus trapping fructose for metabolism in the liver.Hexokinase IV (Glucokinase), also occurs in the liver and would be capable of phosphorylating fructose to fructose 6-phosphate (an intermediate in the gluconeogenic pathway); however, it has a relatively high Km (12 mM) for fructose and, therefore, essentially all of the fructose is converted to fructose-1-phosphate in the human liver. Much of the glucose, on the other hand, is not phosphorylated (Km of hepatic glucokinase (hexokinase IV) = 10 mM), passes through the liver directed toward peripheral tissues, and is taken up by the insulin-dependent glucose transporter, GLUT 4, present on adipose tissue and skeletal muscle. Fructose-1-phosphate then undergoes hydrolysis by fructose-1-phosphate aldolase (aldolase B) to form dihydroxyacetone phosphate (DHAP) and glyceraldehyde; DHAP can either be isomerized to glyceraldehyde 3-phosphate by triosephosphate isomerase or undergo reduction to glycerol 3-phosphate by glycerol 3-phosphate dehydrogenase. The glyceraldehyde produced may also be converted to glyceraldehyde 3-phosphate by glyceraldehyde kinase or converted to glycerol 3-phosphate by glyceraldehyde 3-phosphate dehydrogenase. The metabolism of fructose at this point yields intermediates in gluconeogenic pathway leading to glycogen synthesis, or can be oxidized to pyruvate and reduced to lactate, or be decarboxylated to acetyl CoA in the mitochondria and directed toward the synthesis of free fatty acid, resulting finally in TG synthesis. The synthesis of glycogen in the liver following a fructose-containing meal proceeds from gluconeogenic precursors. Fructose is initially converted to DHAP and glyceraldehyde by fructokinase and aldolase B. The resultant glyceraldehyde then undergoes phosphorylation to glyceraldehyde-3-phosphate. Increased concentrations of DHAP and glyceraldehyde-3-phosphate in the liver drive the gluconeogenic pathway toward glucose-6-phosphate, glucose-1-phosphate and glycogen formation. It appears that fructose is a better substrate for glycogen synthesis than glucose and that glycogen replenishment takes precedence over triglyceride formation. Once liver glycogen is replenished, the intermediates of fructose metabolism are primarily directed toward triglyceride synthesis. Carbons from dietary fructose are found in both the FFA and glycerol moieties of plasma TG. Excess dietary fructose can be converted to pyruvate, enter the Krebs cycle and emerges as citrate directed toward free fatty acid synthesis in the cytosol of hepatocytes. The DHAP formed during fructolysis can also be converted to glycerol and then glycerol 3-phosphate for TG synthesis. Thus, fructose can provide trioses for both the glycerol 3-phosphate backbone, as well as the free fatty acids in TG synthesis. Indeed, fructose may provide the bulk of the carbohydrate directed toward de novo TG synthesis in humans. Fructose consumption results in the insulin-independent induction of several important hepatic lipogenic enzymes including pyruvate kinase, NADP+-dependent malate dehydrogenase, citrate lyase, acetyl CoA carboxylase, fatty acid synthase, as well as pyruvate dehydrogenase. Although not a consistent finding among metabolic feeding studies, high refined fructose diets have been shown to lead to hypertriglyceridemia in a wide range of populations including individuals with normal glucose metabolism as well as individuals with impaired glucose tolerance, diabetes, hypertriglyceridemia, and hypertension. The hypertriglyceridemic effects observed are a hallmark of increased dietary carbohydrate, and fructose appears to be dependent on a number of factors including the amount of dietary fructose consumed and degree of insulin resistance. Shafrir, E. Fructose/Sucrose metabolism, its physiological and pathological implications. In Kretchmer, N. & Hollenbeck, CB. Sugars and Sweeteners, CRC Press, Boca Raton:FL, 1991. The lack of two important enzymes in fructose metabolism results in the development of two inborn errors in carbohydrate metabolism – essential fructosuria and hereditary fructose intolerance. In addition, reduced phosphorylation potential within hepatocytes can occur with intravenous infusion of fructose. The absence of fructokinase results in the inability to phosphorylate fructose to fructose-1-phosphate within the cell. As a result, fructose is neither trapped within the cell nor directed toward its metabolism. Free fructose concentrations in the liver increase and fructose is free to leave the cell and enter plasma. This results in an increase in plasma concentration of fructose, eventually exceeding the renal threshold for fructose reabsorption resulting in the appearance of fructose in the urine. Essential fructosuria is a benign asymptomatic condition. The absence of fructose-1-phosphate aldolase (aldolase B) results in the accumulation of fructose 1 phosphate in hepatocytes, kidney and small intestines. 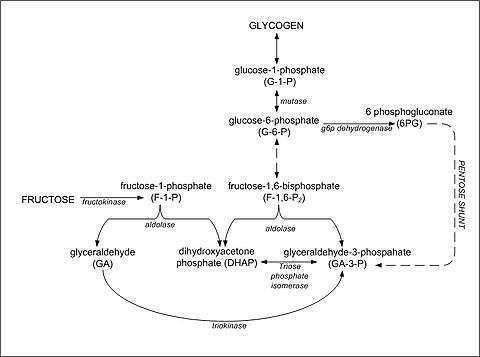 An accumulation of fructose-1-phosphate following fructose ingestion inhibits glycogenolysis (breakdown of glycogen) and gluconeogenesis, resulting in severe hypoglycemia. It is very symptomatic resulting in severe hypoglycemia, abdominal pain, vomiting, hemorrhage, jaundice, hepatomegaly, and hyperuricemia eventually leading to liver and/or renal failure and death. The incidence varies throughout the world, but is it estimated at about 1/20,000 (range 1/12,000 to 1/58,000) live births. Intravenous (i.v.) infusion of fructose has been shown to lower phosphorylation potential in liver cells by trapping Pi as fructose 1-phosphate. The fructokinase reaction occurs quite rapidly in hepatocytes trapping fructose in cells by phosphorylation. On the other hand, the splitting of fructose 1 phosphate to DHAP and glyceraldehyde by Aldolase B is relatively slow. Therefore, fructose-1-phosphate accumulates with the corresponding reduction of intracellular Pi available for phosphorylation reactions in the cell. This is why fructose is contraindicated for total parenteral nutrition (TPN) solutions and is never given intravenously as a source of carbohydrate. It has been suggested that excessive dietary intake of fructose may also result in reduced phosphorylation potential. However, this is still a contentious issue. Dietary fructose is not well absorbed and increased dietary intake often results in malabsorption. Whether or not sufficient amounts of dietary fructose could be absorbed to cause a significant reduction in phosphorylating potential in liver cells remains questionable and there are no clear examples of this in the literature. 1 2 3 McGrane, MM (2006). Carbohydrate Metabolism: Synthesis and Oxidation. Missouri: Saunders, Elsevier. pp. 258–277. ↑ Rippe, JM; Angelopoulos, TJ (2013). "Sucrose, high-fructose corn syrup, and fructose, their metabolism and potential health effects: what do we really know?". Adv Nutr. 4: 236–45. doi:10.3945/an.112.002824. PMC 3649104 . PMID 23493540. ↑ Douard, V; Ferraris, R. P. (2008). "Regulation of the fructose transporter GLUT5 in health and disease". AJP: Endocrinology and Metabolism. 295 (2): E227–37. doi:10.1152/ajpendo.90245.2008. PMC 2652499 . PMID 18398011. ↑ Hundal, H. S.; Darakhshan, F; Kristiansen, S; Blakemore, S. J.; Richter, E. A. (1998). "GLUT5 expression and fructose transport in human skeletal muscle". Advances in experimental medicine and biology. 441: 35–45. doi:10.1007/978-1-4899-1928-1_4. PMID 9781312. ↑ Parniak, MA; Kalant N (1988). "Enhancement of glycogen concentrations in primary cultures of rat hepatocytes exposed to glucose and fructose". Biochemical Journal. 251 (3): 795–802. doi:10.1042/bj2510795. PMC 1149073 . PMID 3415647. ↑ Segebarth C, Grivegnée AR, Longo R, Luyten PR, den Hollander JA (1991). "In vivo monitoring of fructose metabolism in human liver by means of 32P magnetic resonance spectroscopy". Biochimie. 73 (1): 105–108. doi:10.1016/0300-9084(91)90082-C. PMID 2031955. The Entry of Fructose and Galactose into Glycolysis, Chapter 16.1.11. Biochemistry, 5th edition, Jeremy M Berg, John L Tymoczko, and Lubert Stryer, New York: W H Freeman; 2002. Tappy, L; Lê, K. A. (2010). "Metabolic effects of fructose and the worldwide increase in obesity". Physiological Reviews. 90 (1): 23–46. doi:10.1152/physrev.00019.2009. PMID 20086073.